Dubrovnik Region is the southernmost diving area in Croatian Adriatic. Unlike other diving areas Dubrovnik region area is specific for high clarity of sea and great depths that allow diving in relatively few diving locations. Although diving locations are not so numerous as in other regions but they are quite remarkable and worth the experience they offer. 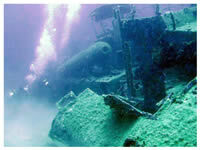 Close to Dubrovnik, lie several wrecks as well as the attractive walls of Elafiti archipelago. Especially interesting are the still present colonies of red coral. In the Cavtat area the most popular are dives on the shipwrecks from the days of Antiquity featuring sites of amphorae and pithos. Of course these sites are a precious part of history and a valuable cultural heritage and taking any of the amphorae or pithos is stricly forbidden. Between islands Mljet and Lastovo lies an archipelago of islets, reefs and rocks called Vrhovnjaci. This area is rich in fish and it is possible to take pictures of some species that are rare in other parts of the Adriatic. The areas of Mljet and Lastovo are under the protection of the Ministry of culture. 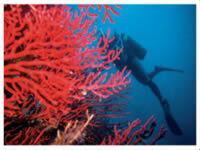 Diving in this area is only possible when organized by licensed diving centres. Diving centres have to be issued with a special permit for underwater activities. in the Mljet area zone lies the largest reef of stony coral in the Mediterranean located in the vicinity of the isle of Glavat and in the Veliko Jezero (Large Lake) on the island itself. This is in the part of the island that belongs to National park Mljet. Several interesting locations of exceptional visibility and varied configuration of terrain lie on the southern side of the island. Cape Korizmeni Rat and islet of štit are maybe the most interesting among these locations, also locations of cape Lenga, Zapetrali and the islands of Vanji Škoj and Nutarnji Škoj feature interesting steep walls. For that special adventure diving at the location of Odysseus Cave is really something to be remembered. Odysseus cave has a wide entrance with pebbles on the bottom of the entrance. It features a clearly visible interior into which large rocks have fallen from the caved in ceiling and an attractive wall in front of the cave full of numerous fish sorts and lobsters. For the divers who enjoy the prospect of free levitation along deep, suken cliffs Lastovo island offers the treat not easily forgotten. Lastovo is and island of steep and still untamed coast with exceptionaly beautiful and clear sea that come in perfect in discovering the deep fissures off the southern coast of the island. To the wonderful diving locations belong also three caves SW coast of Korčula near cape Ključ and the islet of Bijelac with an underground passage through the island off the NW side of Lastovo. Lastovo-Korčula-Mljet is maybe the most popular diving zone often visited by experienced divers, underwater camera operators and video photographers. One of the most interesting dives in the whole Adriatic certainly belongs to the peninsula Pelješac and the wreck of the German torpedo boat S-57 from the WW II. This unfortunate boat was scuttled by its commander after a bitter fight with British ships in order to prevent falling to Allied hands. 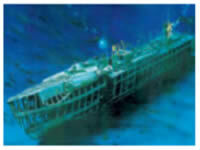 Nowdays the wreck lies at an ideal depth of 20 to 37 meters in general condition of good visibility. In a 25 minute dive one can enjoy the reconaissance of this still armed warship with its special attraction of still moveable and loaded double-barreled anti-aircraft cannon on the bow. On the deck still lie two torpedoes as they did more than 50 years ago when this ship was a deeply feared sight on the horizont. In the interior of the boat there is a marvellous sight of sea bass, groupers and conger eels, also the unavoidable shoals of fish congregating around the wreck. For film takers this dive is a must do when diving in Dubrovnik region. So come with us and don't miss out, join a dive on one of the diving attractions in Dubrovnik region ! For more info you are free to contact us!